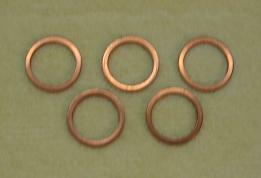 Set of five copper crush washers measuring 7/16" (inside diameter) x 5/8" (outside diameter) x 1/32" (thickness). Metric measurement approximately 11mm x 16mm x 0.8mm. Useful for sealing brake hydraulic fittings and oil pan drain plug bolts. Brand new, made in the USA.